Finding cousins who can help solve genealogical mysteries are what many of us are hoping for when we do DNA testing. 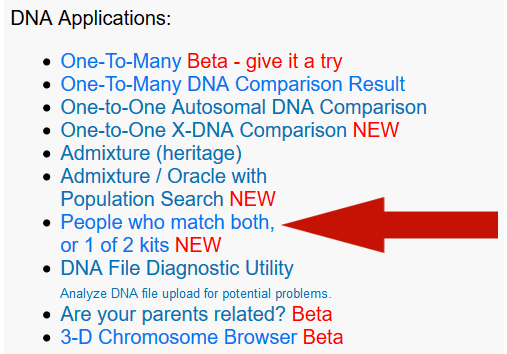 The various One-to-Many tools at GEDmatch Genesis list all the people who match the DNA kit you specify. These are cousins or even closer relatives. The new beta version of the One-to-Many tool is found under the heading DNA Applications in the right hand column of your home page. My red arrow points to it in the image to the left. It is a much improved tool, more like what was available on GEDmatch. When you click on it, you get a form as shown below which only needs the kit number added. One of the great features of this tool is that every column is searchable by putting text in the box above the column and then clicking the enter key. [UPDATE: this is a Tier 1 feature only and is more directly called a filter]. Another one is sortability via the up and down arrows at the top of the column. When working with my Jewish side, I sort by largest segment to get my closest cousins at the top. The reason I do that is that endogamous populations will often share many small segments from way back so the total cM make a triple 5th cousin look like a 2nd or 3rd ; however close cousins will always share larger segments. You can click on any kit number to get a One-To-Many for that kit or click on the underlined largest segment number to compare the cMs of the two kits for either autosomal or X. In both cases you are taken to a prefilled in form on which you can make changes to (don’t yet) before you click the Submit or Search button. On the X comparison, I recommend you click the “Prevent Hard Breaks ” because there is a large gap in the middle for many tests otherwise. New matches will be indicated by having their names and days since upload colored in green. The green gets lighter the longer they are there until it eventually goes away. GED wikitree When GED or wiki appear in this column, click that word to get to a tree for this kit (*currently the Wikitree links are gone, coming soon …) – click here for my post on GEDCOMs at GEDmatch. Age How many days since the kit was uploaded. Newer kits have this number and the name highlighted in green. Type This is probably meant to show which chip version but all are a 2 at the moment. Haplogroup there is a column for the mtDNA haplogroup and the Y haplogroup, self reported. Total cM The total of all shared segments of 5 centimorgans (cM) or larger. Details Click the X to get the one-to-one X report. Total cM Total matching cMs on the X. Overlap The overlap column indicates how many SNPs the kits being compared have in common. It is color coded to show whether there are enough of them for it to be a good comparison; the redder it is, the worse it is. When you find a new DNA relative in your One-To-Many, it is time to use the tool called “People who match both, or 1 of 2 kits,” perhaps a confusing name. What this tool does is list all the kits that are in common with two specific kits as well as the not in common kits. After showing the kits in common, it lists the kits that only match the first kit and then the kits that only match the second kit. There is a form to set the thresholds. Like most tools, start by using the defaults then perhaps move down to 8 cM in common for a less intermarried group or to a higher number for an endogamous group. By looking at the output from this tool, you can often see where this new relative fits into your family. You are the first blogger to address the “new” Gedmatch (that I know of, and I follow many). Thank You! Just when I’m wondering how the beta version is any different from the other version, you come along and tell me. Thank you so much for always posting the information we need….at the right time!